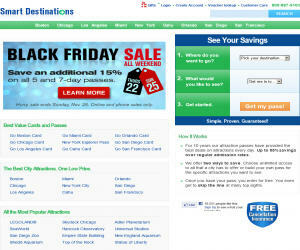 If you want coupons for smartdestinations.com, then GetDiscountCoupon.com is the place for you. Just click on the code to copy smartdestinations.com discount code. Then paste it in the coupon box during checkout and click apply. This amount will be automatically deducted from total price. We're always updating new Smart Destinations discount coupons. Get a FREE full-color guidebook with the purchase of a Go City Card or Explorer Pass. Boston Summer Family Fun Pass - 32% off 4 attractions for one low price! FREE admission to over 30 Chicago attractions with the Go Chicago Card. Go Boston Card: 70+ Boston attractions, tours and museums for one low price. Save up to 55% on tickets! Save 5% on all 1 to 2 day Go City Cards. Explorer Pass: see the best New York City & Las Vegas has to offer. Save up to 45%! San Diego Summer Family Fun Pass - Save 36% on 4 attractions for one low price! Los Angeles Summer Family Fun Pass - Save 32% on 3 attractions for one low price! Hawaii's Best Attraction Pass: Go Oahu Card! Save up to 55% on tickets. Go Orlando Card: Over 50 Orlando attractions for one low price. Save up to 55%! Go Select Chicago: Your Personalized Pass to Chicago. Go Select San Diego: Your Personalized Pass to San Diego. Go Select Los Angeles: Your Personalized Pass to LA. Go Select San Francisco: Your Personalized Pass to San Francisco. Get FREE express shipping on all Go City Cards and Explorer Passes. Save $15! Black Friday Sale - Save up to 15% on select Go Cards! End of Summer Super Sale! Save an extra 15% instantly across all destinations! Go San Diego Card: save up to 55% on regular admission rates like SeaWorld Orlando, LEGOLand and more! Get 18 holes of golf in Hawaii FREE with a 3, 5 and 7 day Go Oahu Card. Visit LA's best theme parks with the Los Angeles Theme Park Pass. Save 26% on admission prices! Purchase a New York City Explorer Pass and receive 20% savings on a Manhattan Helicopter Tour! See the best of Hollywood Go Select Los Angeles! Get a FREE Boston Duck Tour ticket on all 3, 5 and 7 day Go Boston Cards. San Francisco Explorer Pass: Visit 3 Bay Area attractions--including Alcatraz--and save up to 29%! Never miss coupons from Smart Destinations! Enter your email below and we will send you the latest and greatest Smart Destinations deals. Save up to 55% over regular admission rates on top attractions in 9 US destinations. Site for Go City Cards, Explorer Passes, and Go Select Passes: Smart Destinations. Smart Destinations is the company behind America's best multi-attraction pass products with the goal of saving travelers money when on vacation. Our attraction cards offer included admission to top attractions, activities, tours and museums for one low price! Customers can save up to 55% compared to buying separate tickets at the attractions and receive a free full-color guide book with purchase. For 10 years our attraction passes have provided the best deals on attractions every day. Up to 55% savings over regular admission rates. We offer two ways to save. Choose unlimited access to all that a city has to offer or build your own pass for the specific attractions you want to see. Once you have your pass, you enter for free. You even get to skip the line at many top sights. Smart Destinations was founded to aggregate the ticketing and marketing of the things people do when they get to their travel destination. The "last unwired space in travel" required a system that was robust enough to meet the demands of both travelers and the myriad museums, tours, attractions, restaurants, and shopping partners that those travelers visit. Once you have find the available Smartdestinations.com promo code, choose the best Smartdestinations.com code according to your needs because you can have multiple promo codes for Smartdestinations.com. You should check any restrictions and policies before applying coupon, such as expiration date, because some coupons are valid for very short period, So if you need a Latest Smartdestinations.com Promo Coupon / promotion code please BOOKMARK US (Ctrl + D) and check this site frequently. And one important thing some coupon codes are case-sensitive.